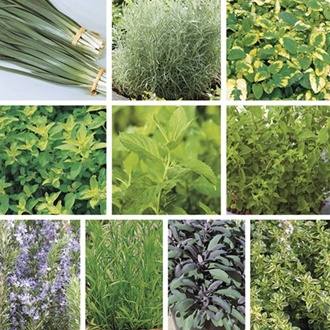 No garden is complete without the addition of some herbs – and all of these varieties are fully hardy and incredibly easy to grow and manage, whether planted in the ground or added to patio pots and window boxes. Herbs can help turn a dish into a real feast, such as lamb paired with rosemary and sage added to pork dishes – the combinations are limitless! Curry Plant-Not often used, but should definitely be considered. It pairs beautifully with eggs, yoghurt, cheeses and even fish and its perfect for flavouring vinegar blends. French Tarragon-A delicious herb and great paired with chicken and fish. Also add a few sprigs to flavour vinegar to make a superb salad dressing. Garlic Chives-Taller than normal chives and flat leaved, this valuable and long-lived perennial has a mild, garlic flavour which complements a host of dishes. Has attractive, white flowers. Lemon Balm Variegated-This long-lived perennial has pungent, lemony foliage which can be used in so many dishes - perfect for adding to salads, white sauce for fish, mayonnaise, poultry and pork. Lemon Thyme-A wonderful and unique flavour adding citrus notes to meat and fish dishes. Looks very attractive grown in pots and window boxes. Marjoram Gold Tipped-A cousin of oregano with a spicy-sweet flavour. Ideal to create a fragrant tisane or chopped into salads. Blend with butter to create a tasty fish for sauce, or add to meat casseroles immediately before serving. Peppermint-In our opinion, the best mint selection for making mint flavoured tea. The flavour is sharp and intense and incredibly refreshing. Oregano Hot ‘n’ Spicy-The classic pizza herb and redolent of so much Mediterranean cooking. No self-respecting herb garden should be without oregano – the leaves of this selection have a spicy twist! Rosemary Tuscan Blue-One of the best to grow with attractive silvery-blue foliage and neat and upright habit. A classic for serving with lamb and all types of Mediterranean dishes. Purple Sage-Strong and robustly flavoured and much famed for adding to stuffing’s, especially with pork or poultry. Evergreen foliage.